Sam Wildow | Daily Call Heather Maxwell, right, owner of Blue Bow Boutique, with her mother Judy Favorite, who will help operate the Piqua location of the Blue Bow Boutique at 325 N. Main St.
Sam Wildow | Daily Call The Blue Bow Boutique, located at 325 N. Main St., held a soft opening on Thursday morning. The pillows are handmade from a local artisan in Covington. 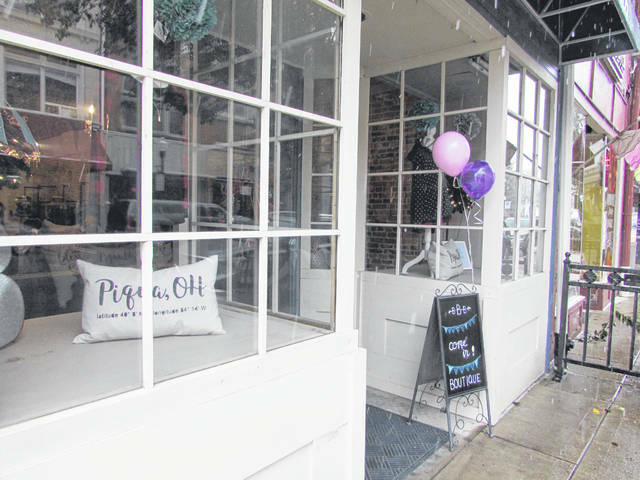 PIQUA — A new boutique held a soft opening on Thursday morning on Main Street, offering shoppers a variety of women’s clothing options, accessories, and home decor items. 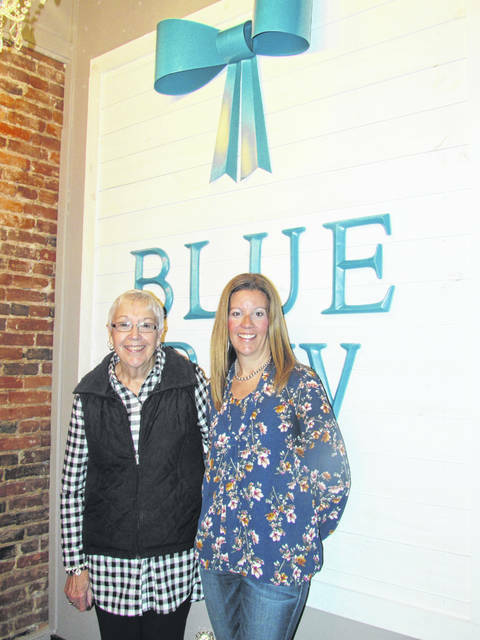 The Blue Bow Boutique, located at 325 N. Main St., will continue their soft opening through Friday and Saturday during Miami County’s Holiday Welcome Weekend. “This is our third location,” owner Heather Maxwell said on Thursday. Maxwell opened her first location in Troy approximately five years ago, and they also have a location in Greenville. They were recently looking for a third location when they found their new spot on Main Street in Piqua. “We kind of felt like this was the perfect location,” Maxwell said. Some of the home decor items in Blue Bow Boutique come from locally sourced artisans. The variety of clothing in the Blue Bow Boutique come from vendors in California, Maxwell said. Affordability is also a priority for the Blue Bow Boutique. “We try to keep our price points really low,” Maxwell said. She said that there is nothing over $52, which is a pair of jeans. The shirts that are available are in the $20 range. Maxwell said that it had always been a dream to open a boutique, and a few years ago, she decided to take the leap. The Blue Bow Boutique is filling the space that was previously occupied by the Harvest Pantry. The Blue Bow Boutique is also located at 108 E. Main St. in Troy and 401 S. Broadway St. in Greenville. 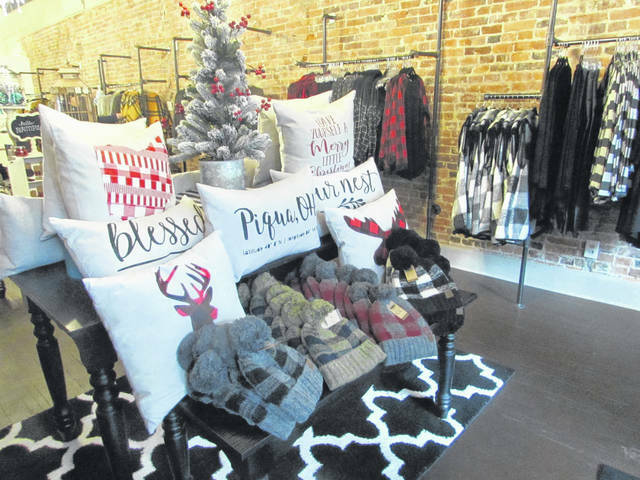 Their hours are from 11 a.m. to 6 p.m. on Monday through Friday, and Saturday from 11 a.m. to 4 p.m.
https://www.dailycall.com/wp-content/uploads/sites/30/2018/11/web1_Blue-Bow-Boutique-1.jpgSam Wildow | Daily Call Heather Maxwell, right, owner of Blue Bow Boutique, with her mother Judy Favorite, who will help operate the Piqua location of the Blue Bow Boutique at 325 N. Main St.
https://www.dailycall.com/wp-content/uploads/sites/30/2018/11/web1_Blue-Bow-Boutique-2.jpgSam Wildow | Daily Call The Blue Bow Boutique, located at 325 N. Main St., held a soft opening on Thursday morning. The pillows are handmade from a local artisan in Covington.